The Franschhoek Cellar Bistro is situated at the gateway to Franschhoek - a romantic village known for its French Huguenot heritage – in one of the most scenic wine villages in the world. At the Franschhoek Cellar we offer artisanal food using home-grown ingredients and fresh produce. 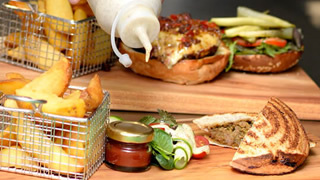 The kitchen at Franschhoek Cellars opens from 11h00 and serves light snacks, lunches and cakes throughout the day. The food is wholesome, hearty and delicious. Chef Jerry Kennedy garners inspiration from the natural goodness of farm life and expertly combines modern and traditional techniques to produce food that is as exciting as it is wholesome. We look forward to welcome you to the Franschhoek Cellars Bistro soon.